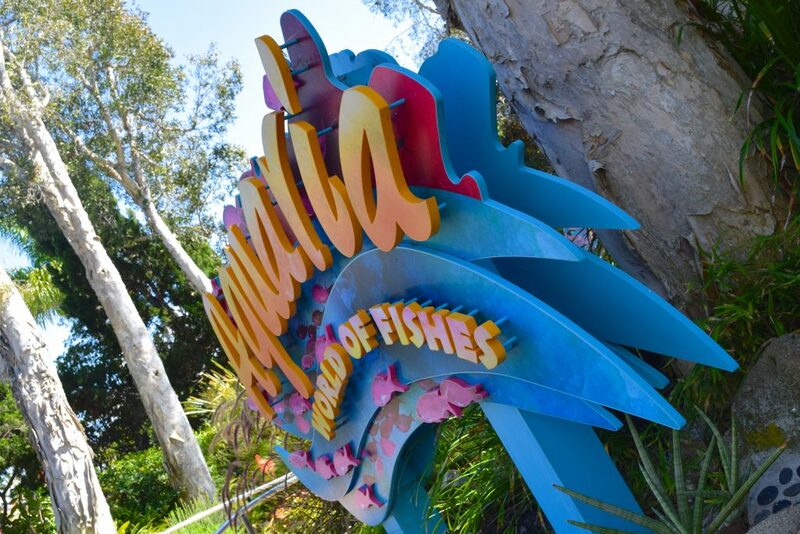 Sean: One of our favorite parks in California is SeaWorld San Diego. 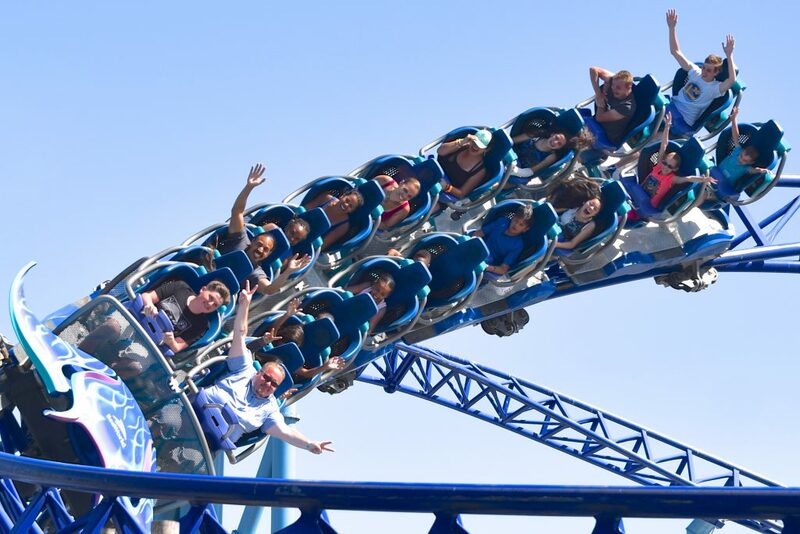 Of all the SeaWorld parks it has the heaviest focus on animals while also offer great entertainment and a good selection of rides. 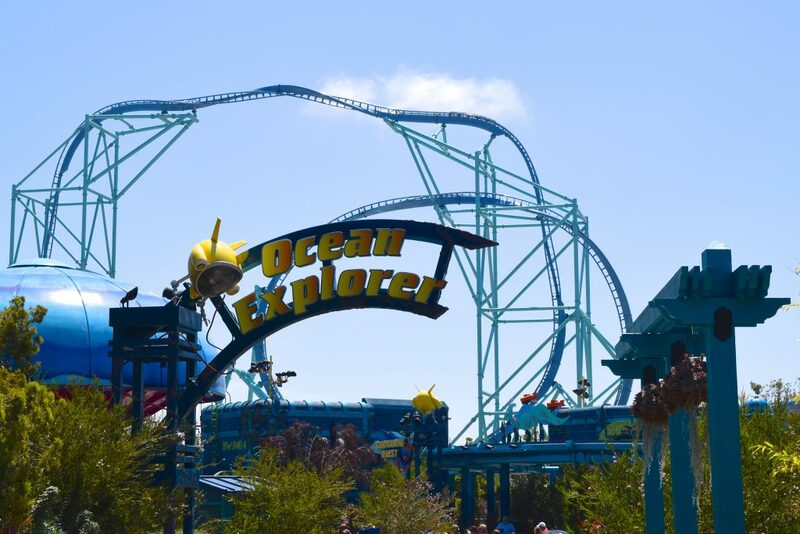 There is always a ton to do and see at the park, and this trip we tried to check out as much as we could, including the new Electric Eel, San Diego’s tallest and fastest coaster! Upon arrival we were very pleased to see how the new skyline of the park looks now that they have opened Electric Eel! For a park with few tall structures, the Sky Rocket II Premier Rides coaster really stands out! The entrance to the park is as clean and beautiful as ever, it’s still by far my favorite SeaWorld entrance with the great use of the Explorer’s Reef as the entrance attraction. We passed through the new-for-2017 Ocean Explorer area, which is home to the defunct Submarine Quest and home to the park’s new roller coaster: Electric Eel! Electric Eel had a bit of a delay opening for guests that day, but only a short 90 minutes after park opening the ride had opened to the public. 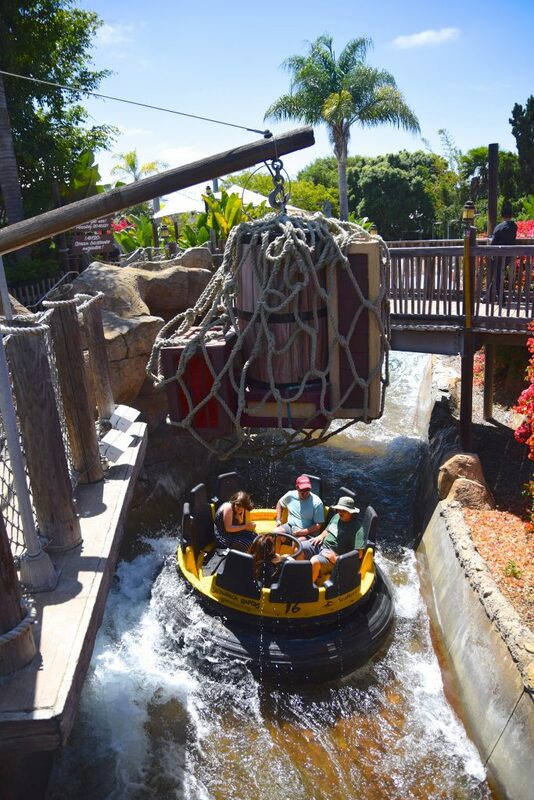 The ride is a perfect fit for the park and really stands out in this lineup of attractions. 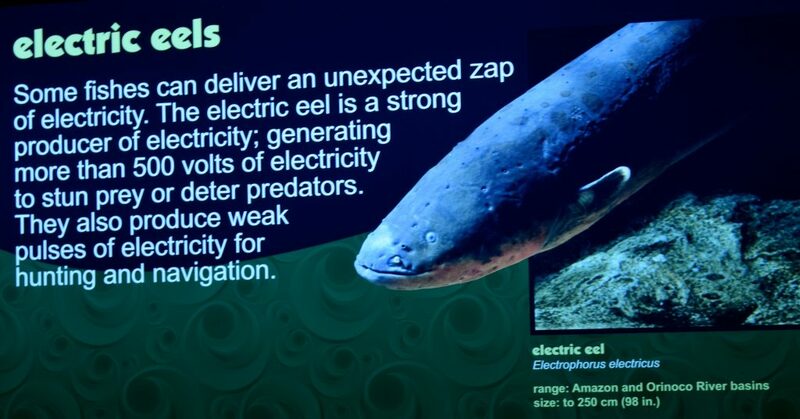 We’ll touch on Electric Eel more later on in the report! 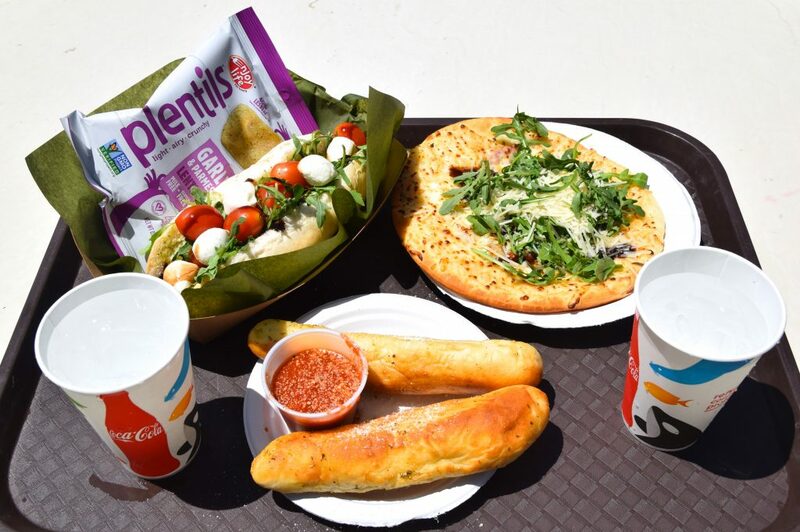 We were both starving as we got to the park so we had an early lunch, something that’s never a bad idea at SeaWorld. 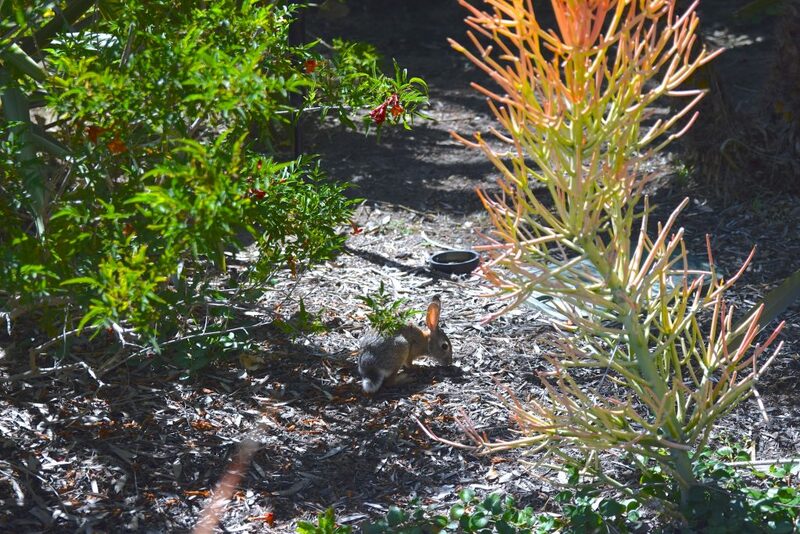 They have particularly great food at all their parks. We checked out Mama Stella’s for pizza and a Caprese sandwich! 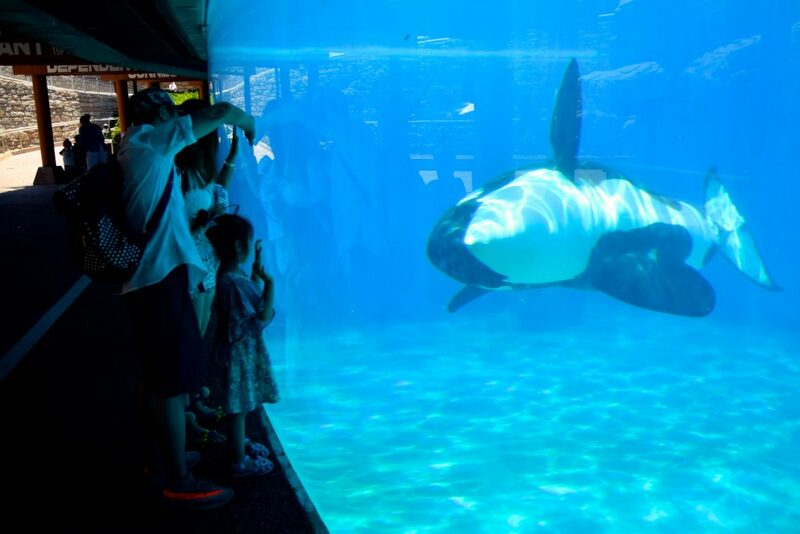 One of my favorite things to do at SeaWorld San Diego is the Orca Underwater Viewing. It was closed for a while last year as they were redesigning the stadium and used this pool as their show pool. Look it’s Corky! 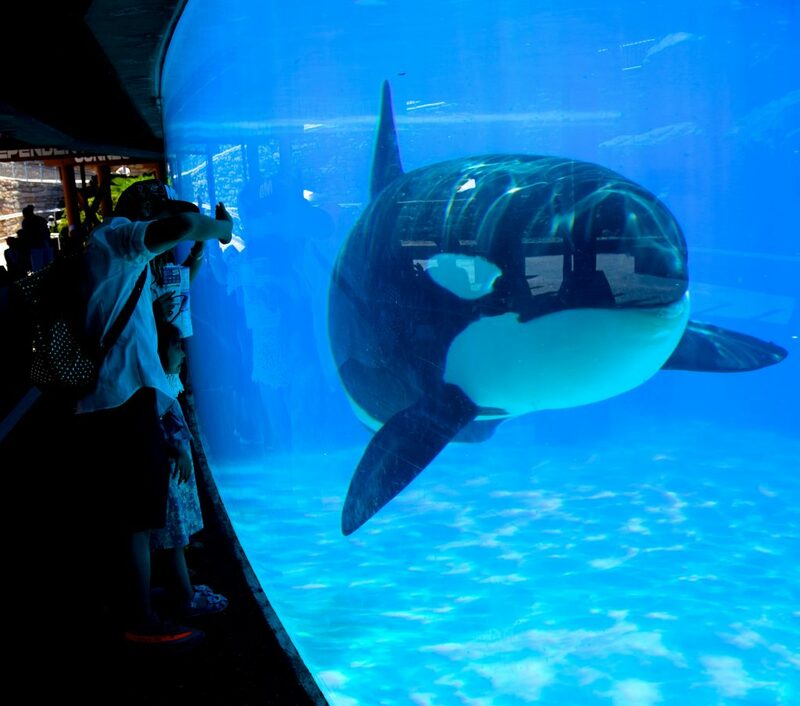 Corky is the oldest killer whale in SeaWorld’s care and is estimated to be over 52 years old. <3 The Orca Underwater Viewing area was quite busy during our visit to the park, and it’s definitely worth checking out! 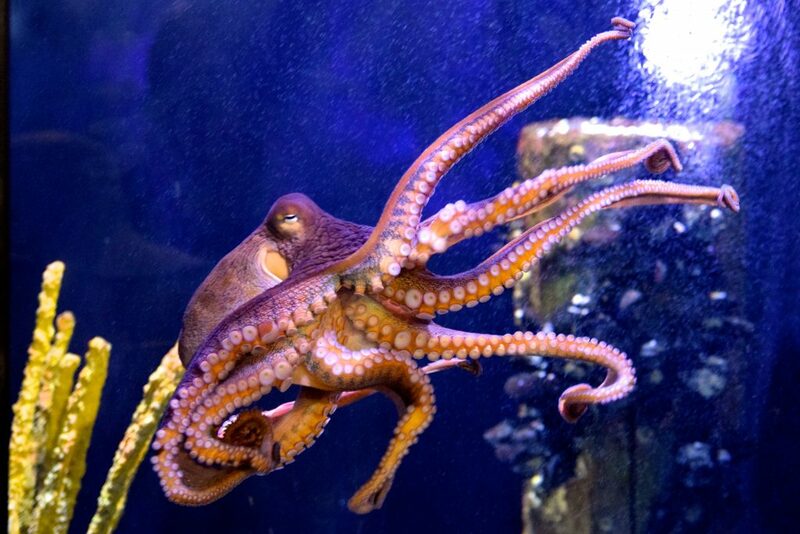 Get out of the sun into the shade and admire these awesome animals. 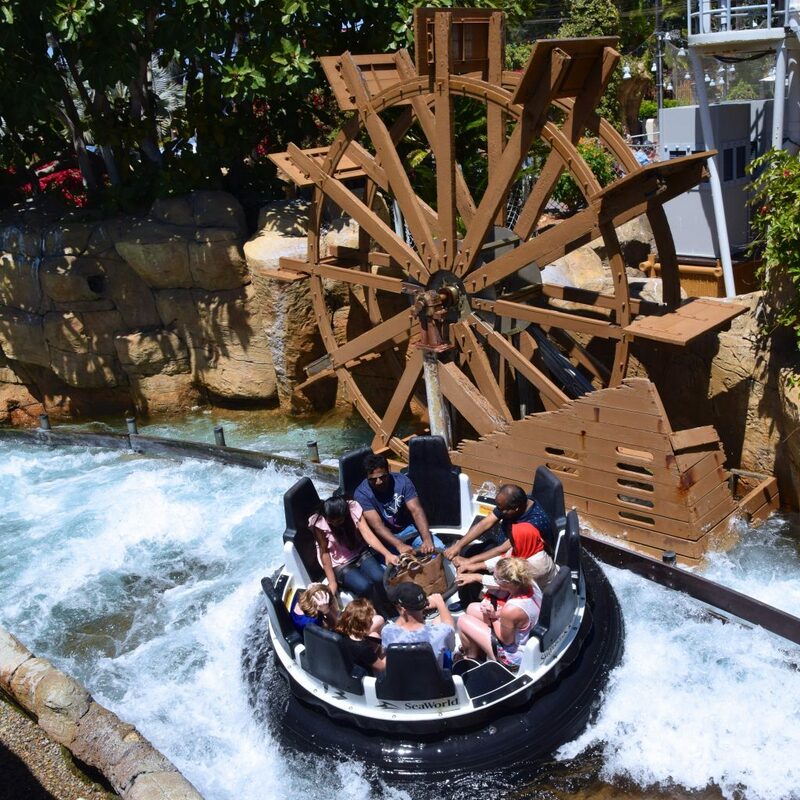 Before we headed over to see some more Killer Whales at the Orca Encounter, we checked out one of our favorite rapids rides: Shipwreck Rapids! This rapids ride is very well integrated with the surrounding area including Shipwreck Cafe, and it features several animal interactions such as flamingos and sea turtles! 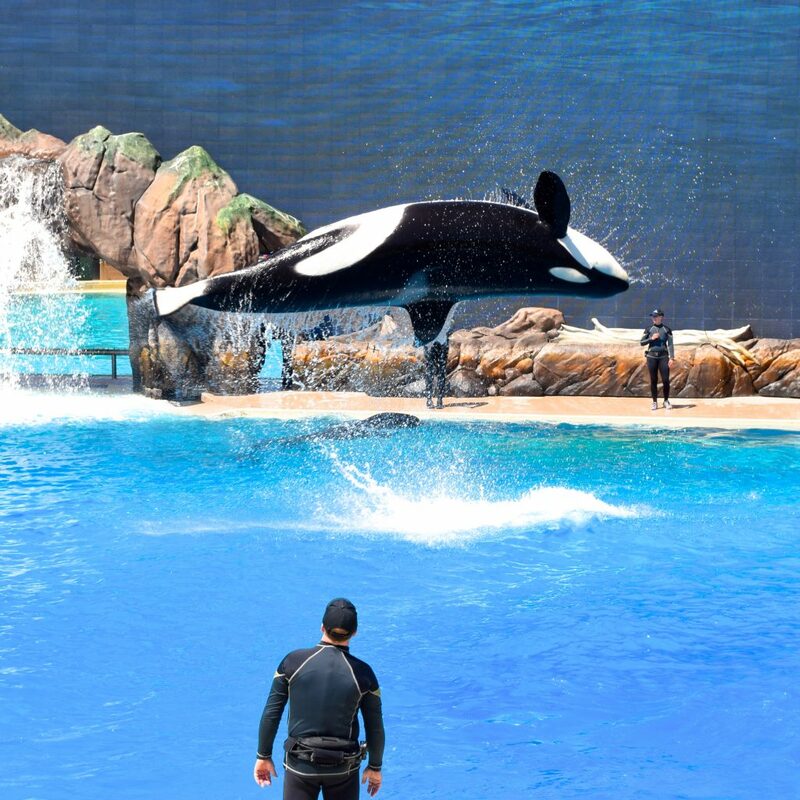 SeaWorld San Diego launched their newest killer whale experience in 2017. 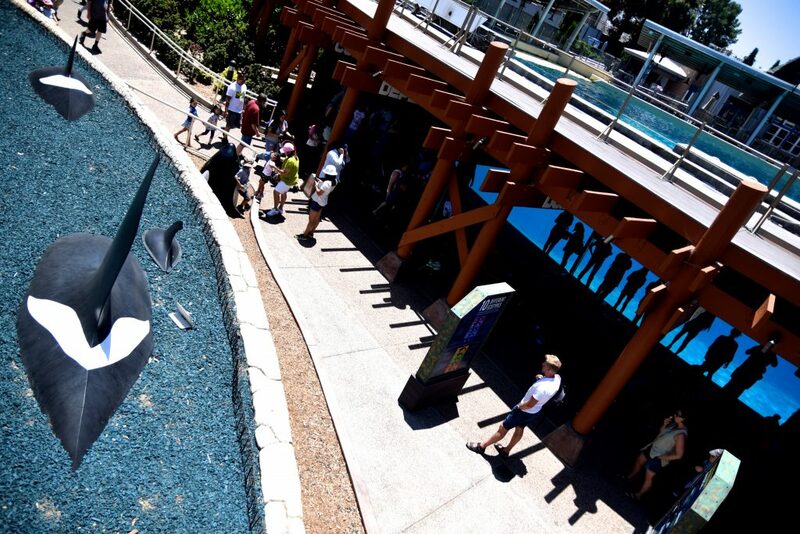 After backlash for theatrical shows, particularly seen by the audience that visits the San Diego park, the company decided to move away from theatrical shows and create a naturalistic setting and display the park’s ten killer whales in an educational demonstration. The Orca Encounter is by far our favorite show they have created in recent years. We have seen the One Ocean version at all three parks, as well as the Light Up The Night shows, and Orca Encounter tops them all. Why? Simply because the show is much more genuine. There is no over-the-top music dancing and spectacular behaviors. Those always seemed to fall short and often even unorganized (particularly in Orlando). This show features behaviors that are very common in the wild, and uses more whales at the same time than I have seen at the San Diego park in years. 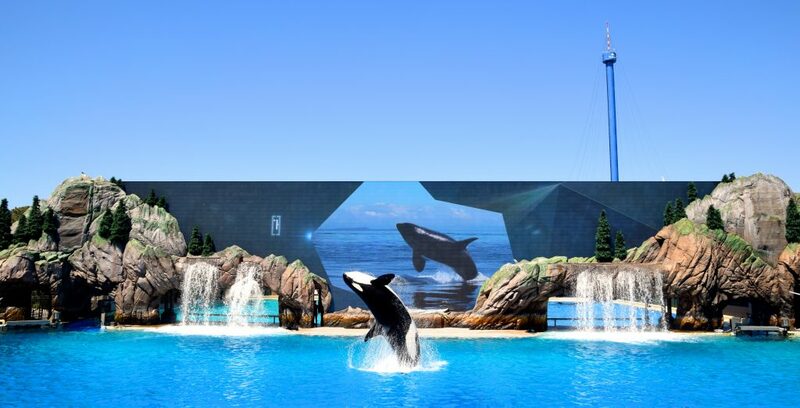 The show is very educational and while using a giant screen in the back to display facts and information, the entire show is filled with killer whales. 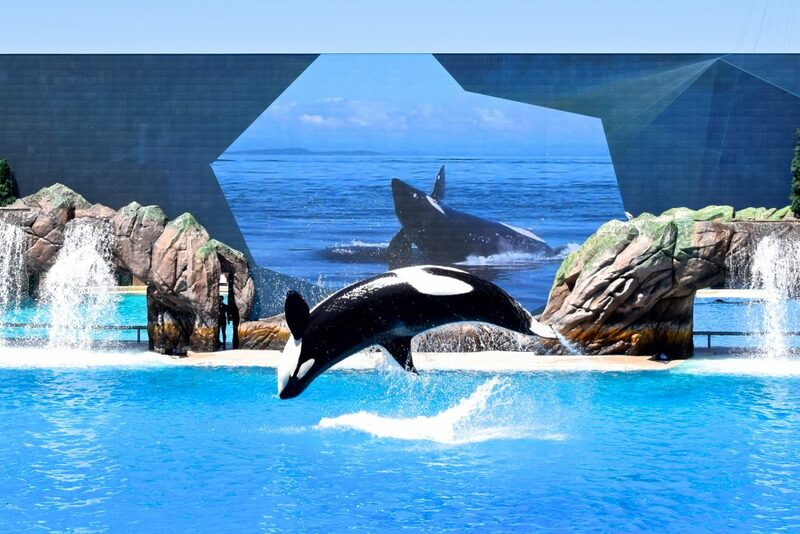 Everything you see on the screen is demonstrated by several killer whales at a time, and the lack of clear “scenes” really makes the show flow and eliminates any downtime. It’s a continuous demonstration in a beautiful setting. SeaWorld San Diego is lucky to have the biggest, and in my opinion best, killer whale pod. The park is home to several very athletic killer whales and 4 large bulls. They are all in great shape and it’s fantastic seeing this killer whale pod in the shows. The great balance between physically seeing the killer whales and their natural beauty as well as the great amount of information on the fantastically big screen in the background is really a plus for the show. 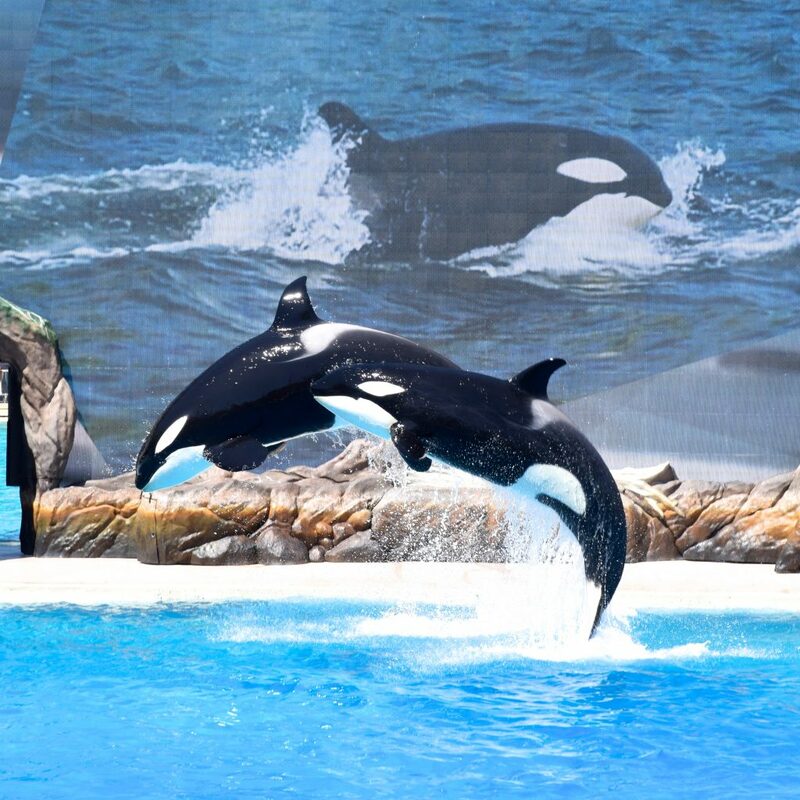 This combination is only possible thanks to the fact that we have killer whales that we can so closely see and explore at facilities like SeaWorld. For the Discovery Kingdom readers among us! Look it’s Shouka! 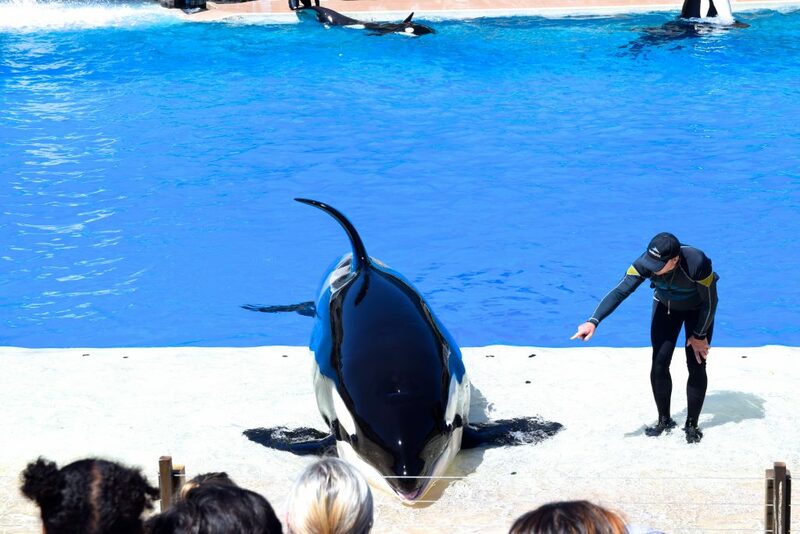 She is thriving at SeaWorld San Diego and in all the demonstrations and shows I have seen over the past years she has always played a major role. What a great orca. 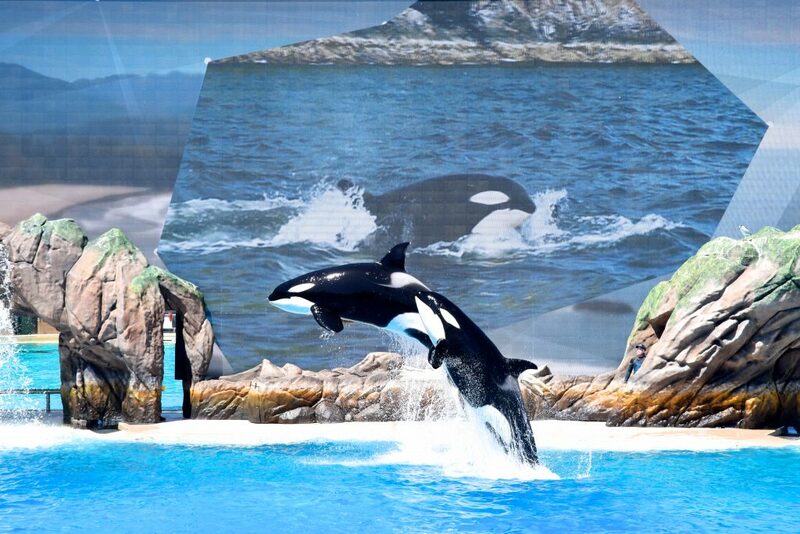 Many fans of the theatrical shows feared that the Orca Encounter would lose all sense of spectacular-ness. The opposite is true, the massive killer whales naturally leap out of the water and that is displayed many times during the show as well. In fact the use of the killer whales in the show is plenty, and you really get to appreciate them more now the flashy background distractions are gone. Several new behaviors are on display at the Orca Encounter, such as Spy Hopping. This natural behavior really didn’t seem fit in any theatrical show but is such an important aspect of the Orca Encounter. To be honest, it is one of my favorite sections of the show, it’s calm cute, and what’s better than several beautiful killer whales spy hopping together? For those looking to still get splashed by killer whales, this show features plenty of that! The new stadium set up is absolutely beautiful as well. 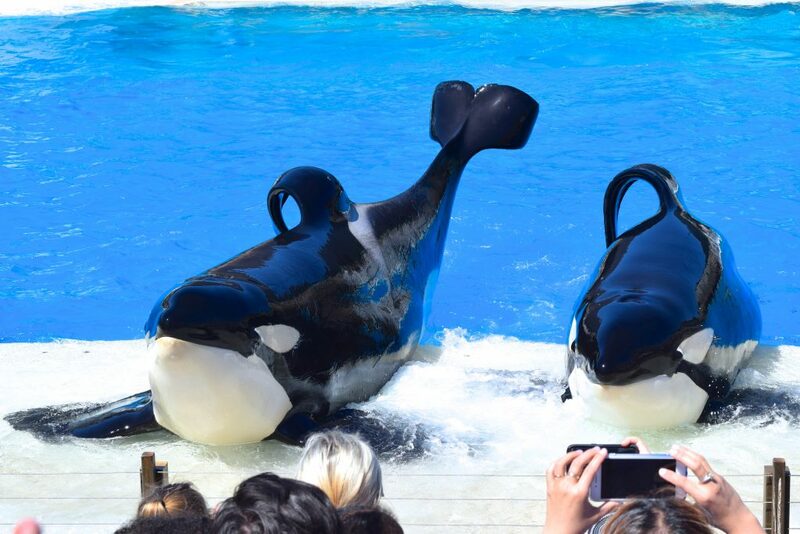 I really hope these changes increase interest in the killer whale aspect of people’s SeaWorld visits, as this is such a crucial experience at the park. An absolute can’t-miss. As mentioned above, the park is home to several large male killer whales, bulls. 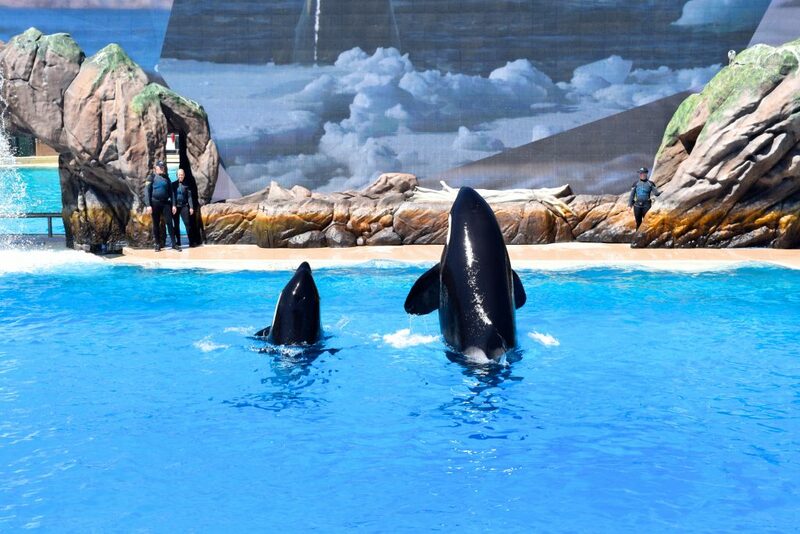 In the show we saw we had the pleasure of seeing Keet (Left) and Ikaika (Right)! These bulls really seem to be a power duo as I often see them perform together, they are beautiful! 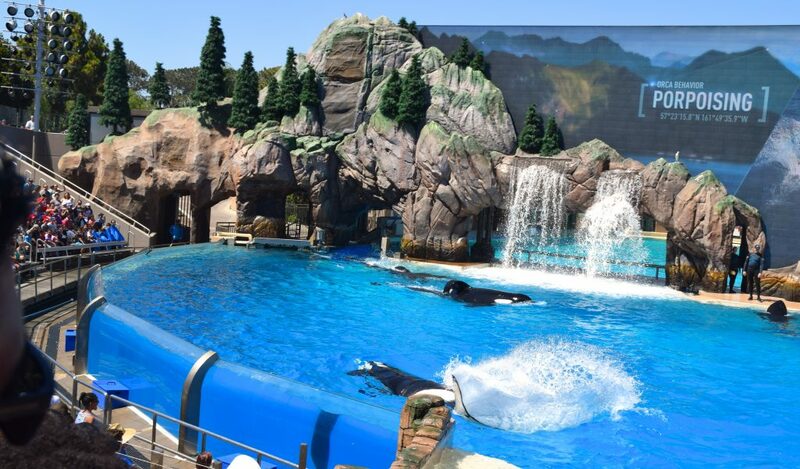 And with these massive killer whales we continue onward with our massive SeaWorld San Diego report! After the Orca Encounter we made a point of trying to see and do all that other big websites do not talk about: Animal exhibits and aquariums. 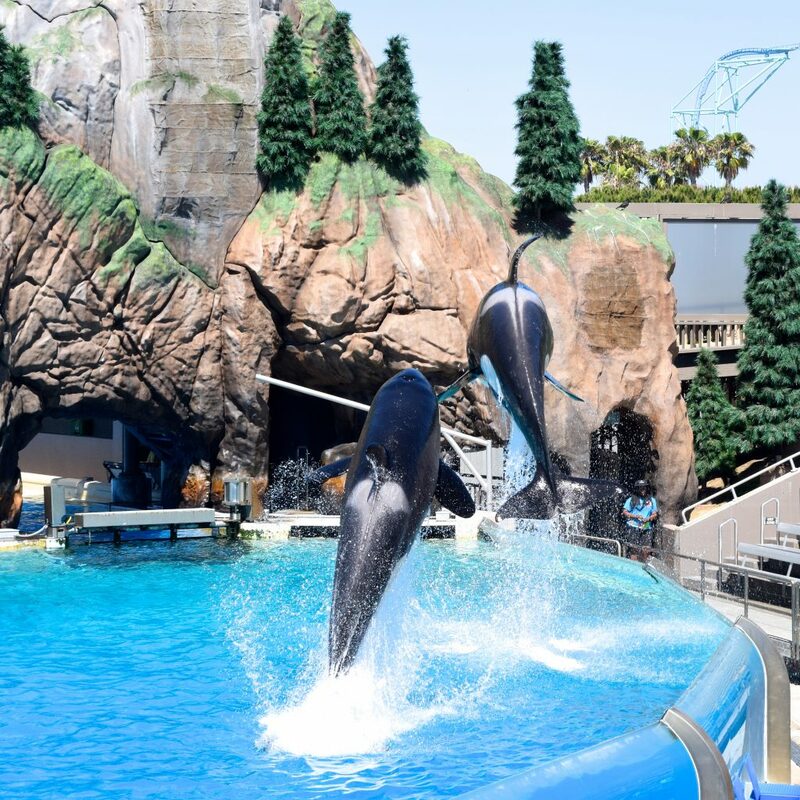 Because honestly there is no better way to really experience SeaWorld and what it stands for than checking out all of the amazing animal exhibits they have to offer. 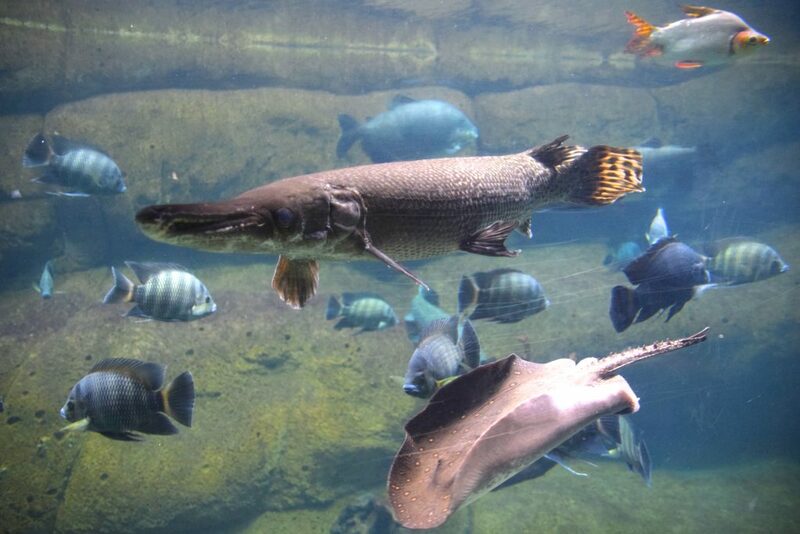 We started off with Aquaria: World of Fishes! 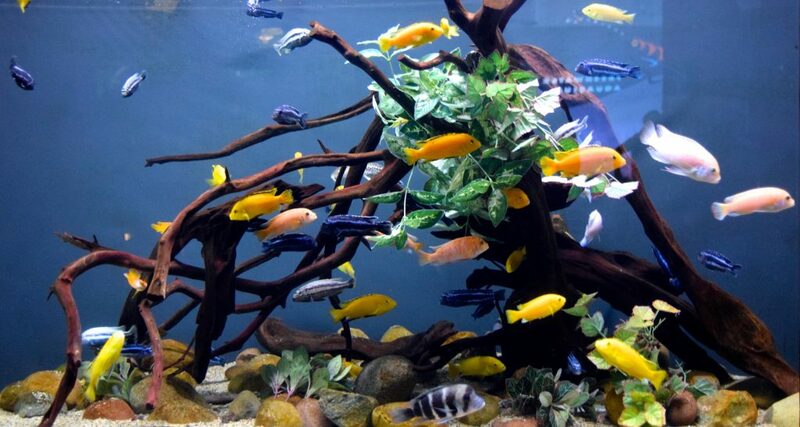 This aquarium is home to a mix of saltwater and fresh water fish and is one of the older aquariums in the park. 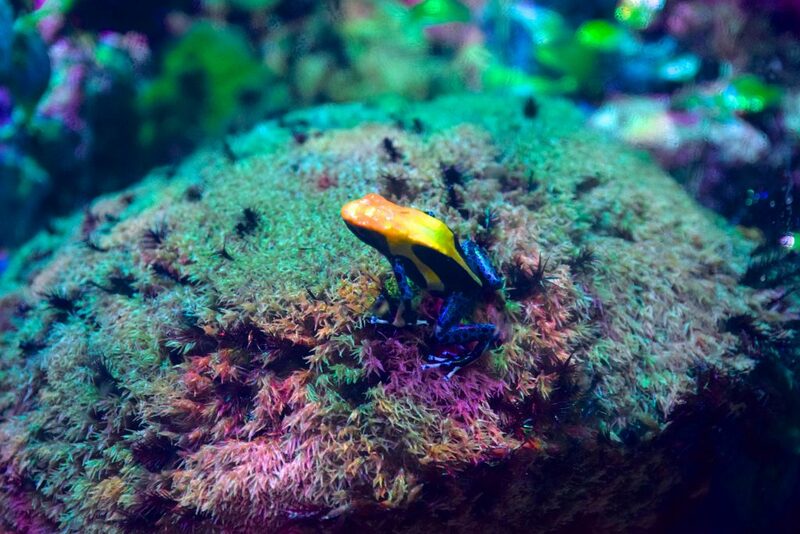 The aquarium also hosts a cute little exhibit with poison dart frogs! They are so adorable and beautiful! 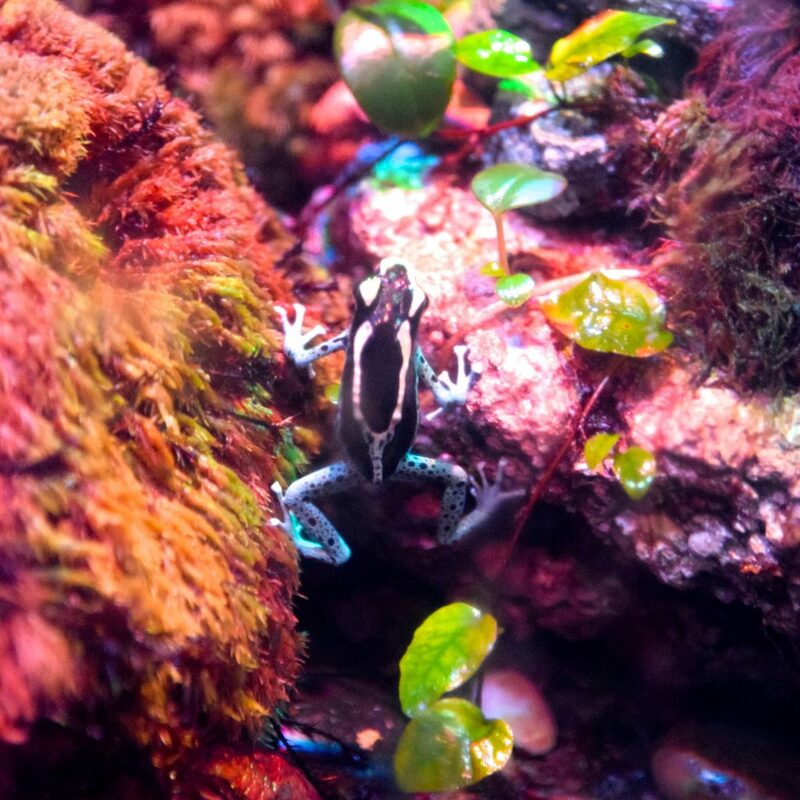 The park has poison dart frogs in several locations, including the Freshwater Aquarium elsewhere in the park, which we’ll discuss in a little bit. The next aquarium we checked out was the aquarium below the Cirque stadium. 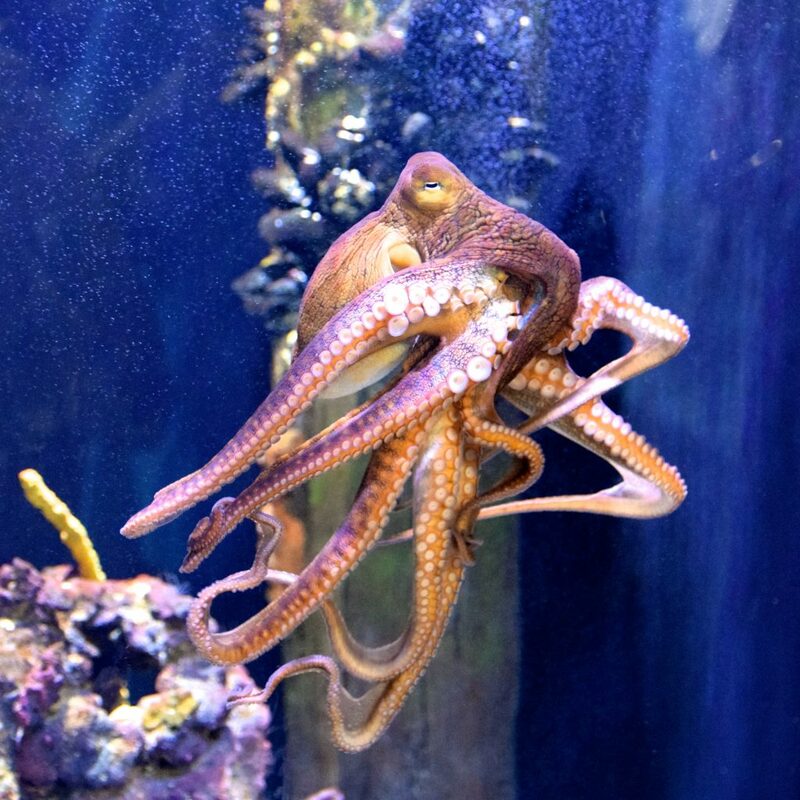 It is now home to octopuses! These kids really seemed into them as well! 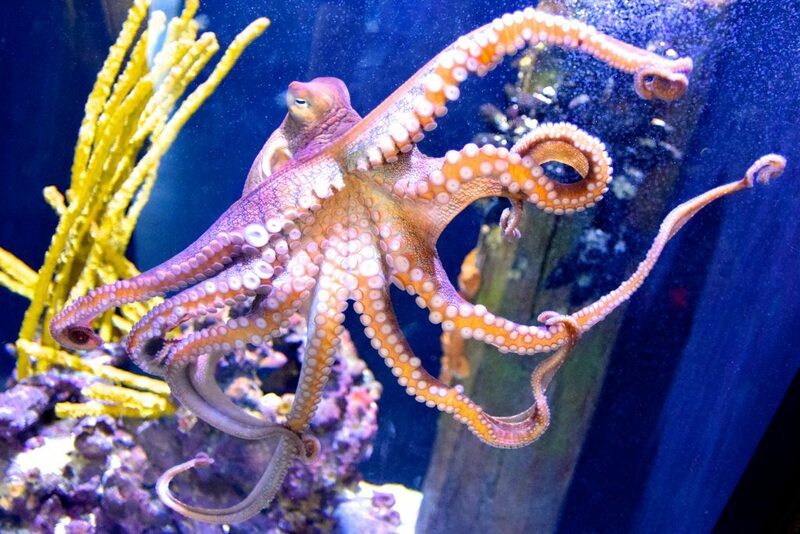 This is one of Alex’ favorite sea creatures, so needless to say we spent quite some time looking at these fascinating animals. It was at this point in the day where we really asked ourselves if any other SeaWorld park offers nearly as much animals to explore as this park does. Our visits to SeaWorld San Antonio and SeaWorld Orlando did not have as many animals, and the lack thereof was noticeable. 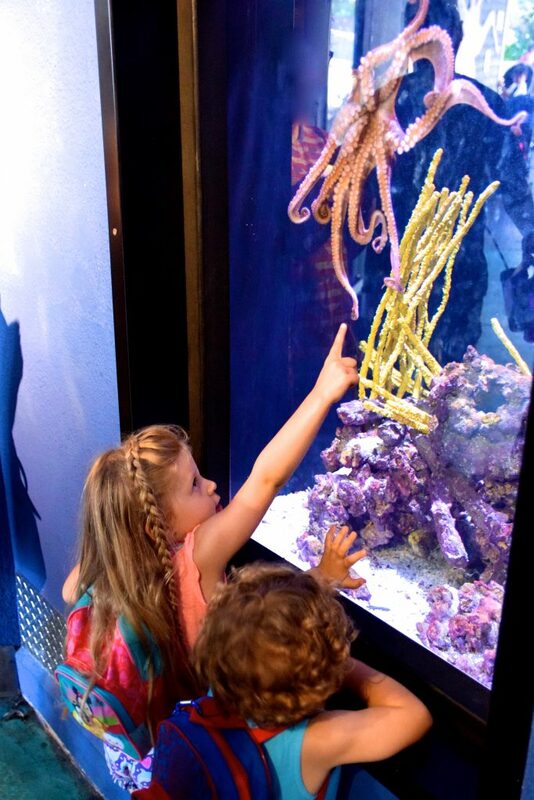 Luckily SeaWorld San Diego has you covered with over 15 animal exhibits. Are we at SeaWorld or Busch Gardens? This rabbit confuses me 😛 Let’s talk about coasters for a bit before diving back into some aquarium talk! 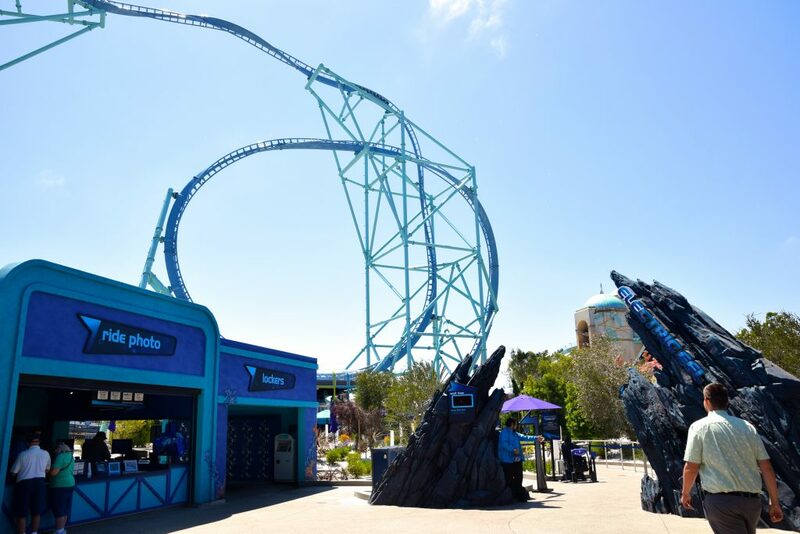 SeaWorld San Diego is home to three coasters, one of which (probably still my favorite) is Manta! This 2012 multi-launch coaster from Mack is one of the world’s best family coasters and packs a punch! The rise is very scenic, terrain oriented, and has aquariums as part of its queue. 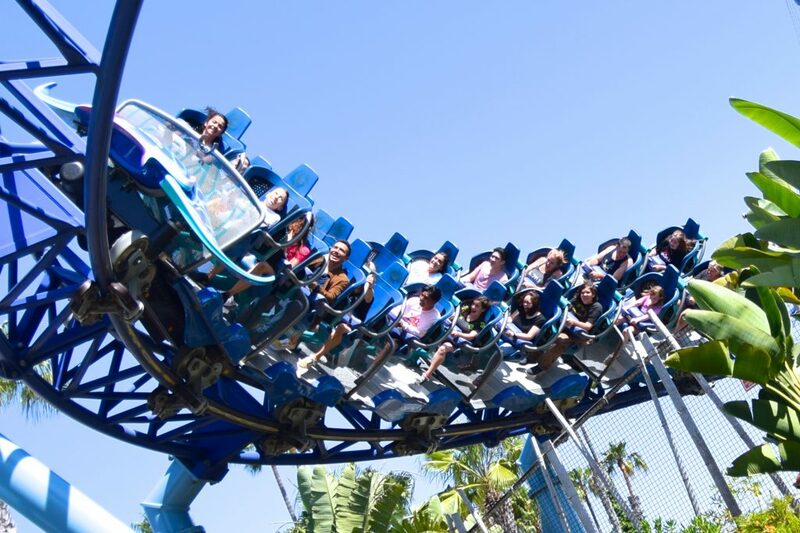 Unlike the much larger intenser Manta at SeaWorld Orlando (which is a flying coaster like Tatsu), Manta in San Diego is perfect for every member of the family to ride. The ride is nicely situated in the center of the park and is visible from many angles. As where the park ran Journey to Atlantis with miserable one-station operations during our visit, they ran Manta efficiently with three trains which allowed for us to reride the coaster multiple times! Right near Manta we find our next aquarium! 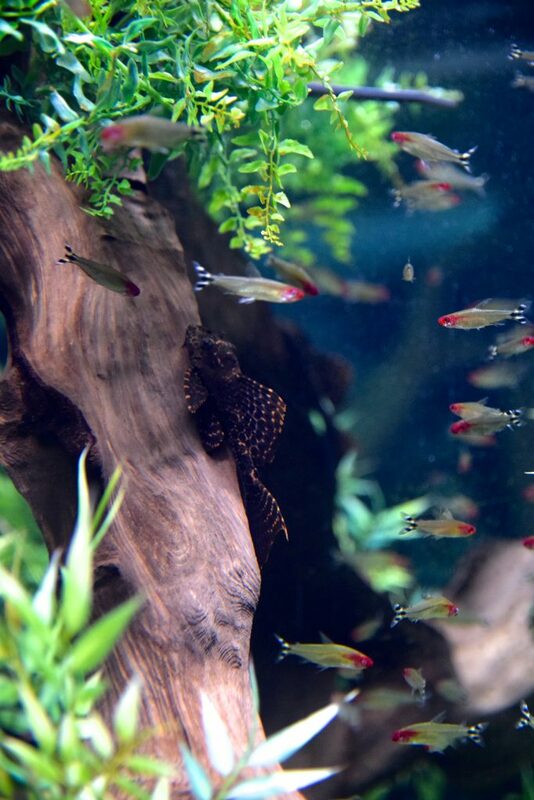 The Freshwater Aquarium! 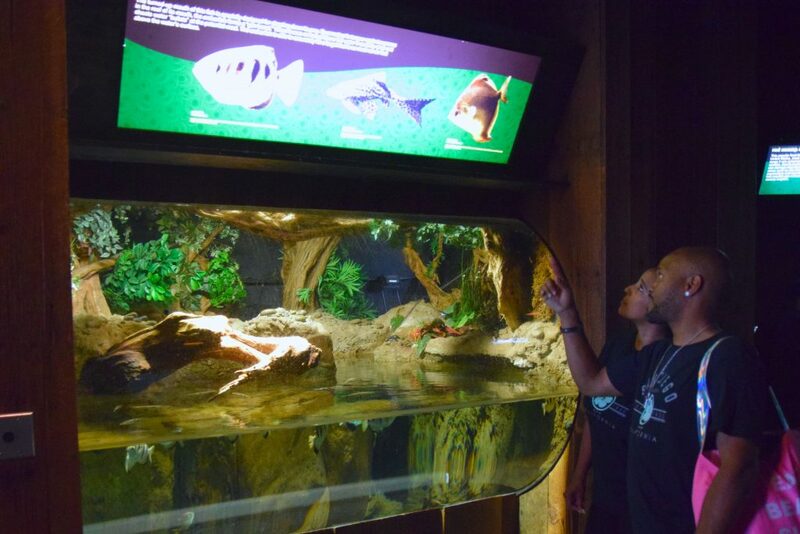 This is one of the larger aquariums and features a couple dozen of different little displays/aquariums with different animals. 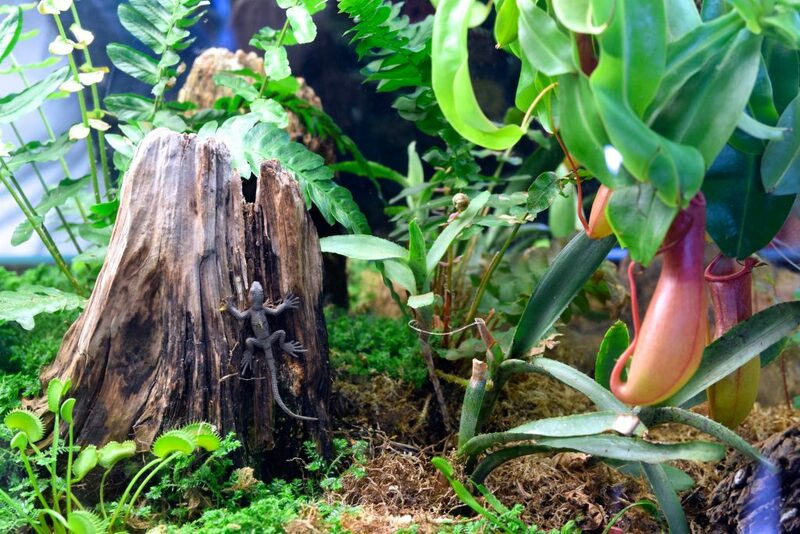 My favorite animal in the exhibit? 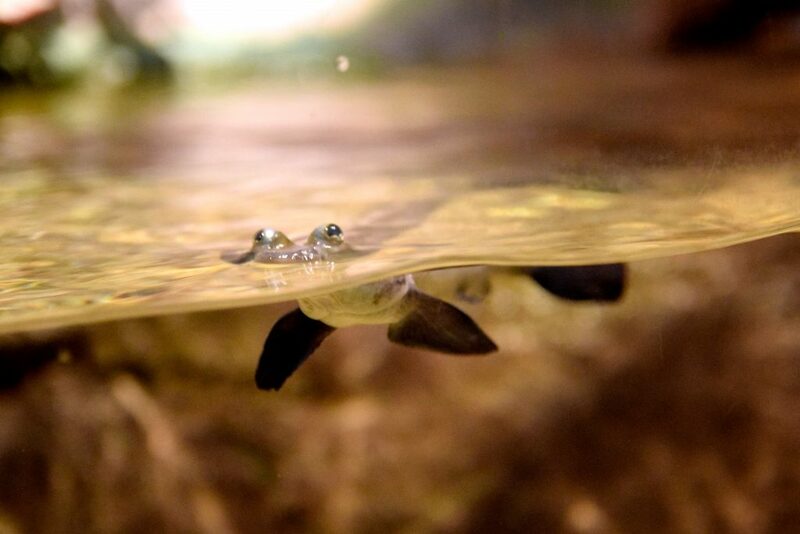 The pig-nosed turtle! 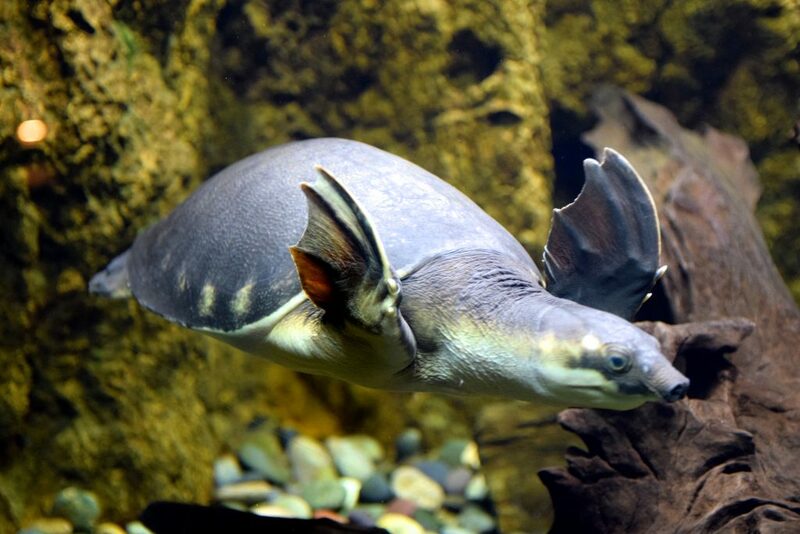 Or as I liked to call it, the elephant turtle. I will be honest with you all now, I should have done a better job remembering or noting down the names of some of these creatures, because they are all beautiful but I can hardly remember what they are called. One thing is for sure, even if you’re not looking to study all the names of these sea creatures, they sure are amazing to look at. 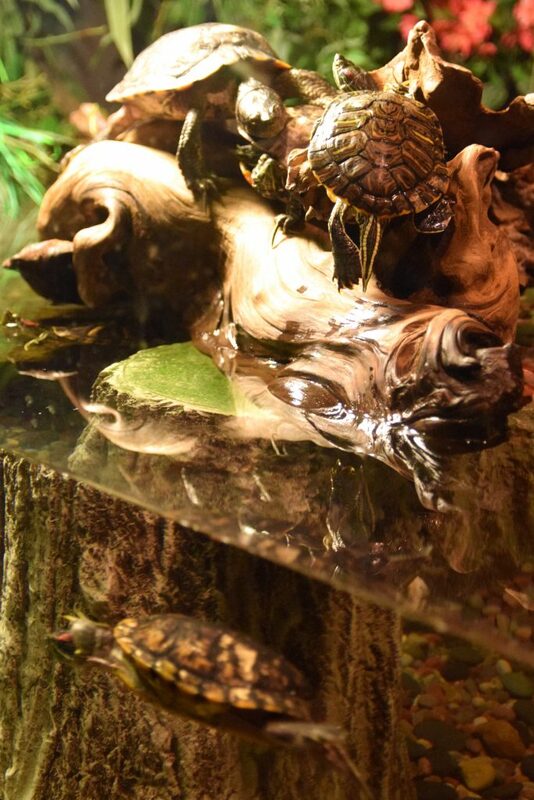 Here are some regular turtles! And a bunch of them! I believe that it is crucial for the park to hold on to experiences like this. There is a reason no parks can top the intricacy of SeaWorld San Diego and that’s simply thanks to all these animal exhibits. 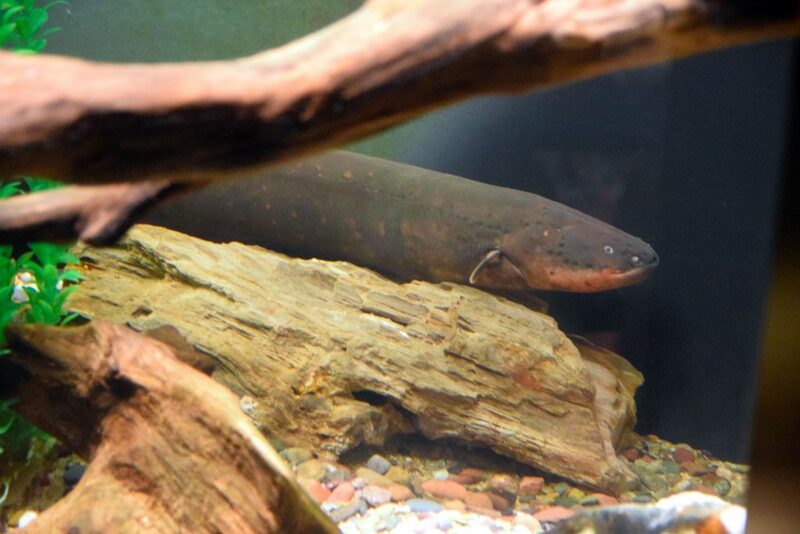 Electric Eel (roller coaster) is not the only attraction by that name in the park, the Freshwater Aquarium is home to a knifefish of the Electric Eel variety! Being ‘zapped’ by one does not sound fun. I’ll ride Electric Eel (roller coaster) instead. To our surprise this aquarium was filled with people, at moments it was hard to take pictures or even look at the animal. It’s awesome to see that the interest for these exhibits is still so strong. 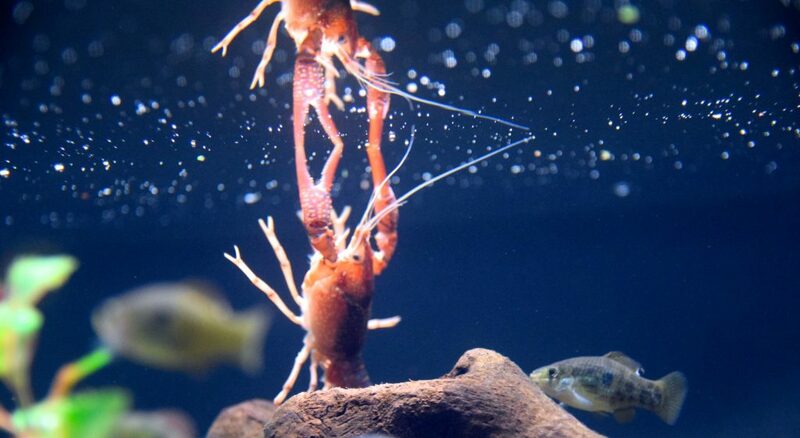 -Fishception- The Freshwater Aquarium has a lot more to offer than we just showed, but what would be the fun of these things if we gave it all away in a report? 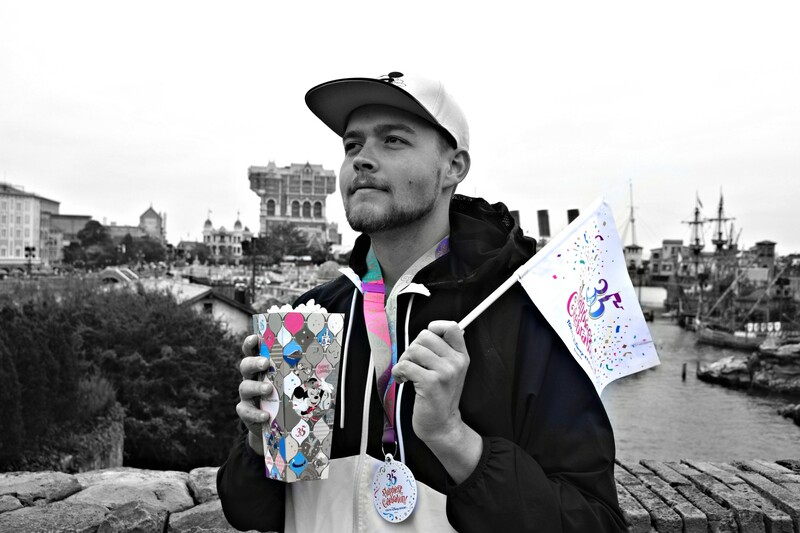 😛 Continue reading our trip report on Page 2 for more coasters and animals! Amazing review!! And yes, the one station ops on JTA were so annoying on my last visit to the park.